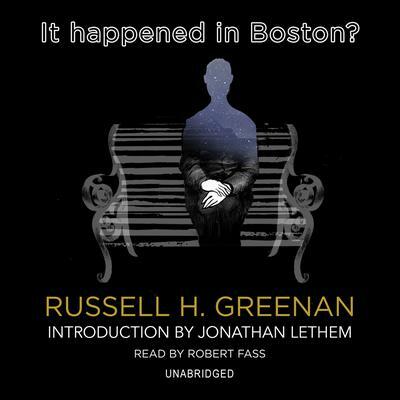 Originally published in 1968 to critical acclaim, Russell H. Greenan’s brilliant, audacious mystery novel It Happened in Boston? quickly became an underground sensation and has emerged over forty years later as a genuine cult classic. In this breathtakingly imaginative book—now appearing in audio for the first time—we enter the mind of an unnamed artist of prodigious talent and intelligence who is determined to correct the world’s wrongs via a direct confrontation with the Almighty, no matter what the consequences. A spellbinding tale told by a memorably unreliable narrator, It Happened in Boston? places you inside a vivid world that brilliantly and surprisingly interweaves art, genius, love, madness, betrayal, God … and murder. In 2003 IHIB? was reprinted by the Modern Library with a new introduction by celebrated writer Jonathan Lethem and an afterword by the author, both included in this audio version. This is the story of an artist with a twisted mind which, after some tragic news, decides to take revenge for all what happened, and tries to find God and kill him, because how can God allow for such misfortunes? This book is like nothing you have ever read before. It cannot be categorized and it seems to bend several literature rules, just to achieve a beautifully written prose. The first half of the book is composed by several flashbacks in random order presenting the artist and the rest of the characters. Each of them has something that makes them unique. Nothing seems to happen in this first part, in which it seems we are thrown upon without any warning. The main character seems to have a disturbed mind and is far from nice or kind. I almost hated him when he killed the family cat. But this is nothing compared to the second half of the book, the part where Greenan puts the puzzle pieces in order and we get the whole story of what happened in Boston. It is the part in which the artist loses touch with reality and the story becomes really dark. While I was listening to this book I had the impression that I was watching a play where I could see the all the characters. The language used by the author is really rich and almost petulant at some points, in order to illustrate the personality of the artist, which is an arrogant man full of himself. I also think that this book focuses on the form rather than in the content, which seems deceitful at times. The book is narrated by Robert Fass, and let me tell you that this was a wonderful narration, very clear and 'bright'. As the book is written in first person, Fass becomes the artist, but he also displays an ample range of voices for the rest of the characters, which Fass helped to bring them to life. If you are in for something different and want some rich language literature, I encourage you to listen to this book. I am sure it will not leave you indifferent. Great Listen !! Excellent Narration!!! 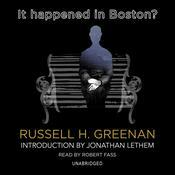 I don't agree with the negative review's on IT HAPPENED IN BOSTON..I did really enjoy the story .. The narration was supurpub ..~ another book I just couldn't put down till my eyes blurred and the clock was saying 3am time to sleep ~ kept me right on the edge till the last page ~ great job and love the storyline ~ will I tell much about the book absolutely not and ruin it for you just know you must get this one .. I found this book uninteresting and only finished it because of my obligation to provide a review. The forward is ridiculous and tries to convince the reader that they are about to read a masterpiece worthy to be studied in Literature classes. What you actually get is a story that rambles aimlessly and is written in a pretentious manner that put this reader off. In several places, the author lapses into excruciatingly long-winded descriptions that cause this story to grind to a halt. On the plus side, it was humorous at times, but not enough so that I would recommend other readers to slog through this book. A little scattered at times. Some parts excellent. Very emotional when Danielle was trying to save Little Boy. Need to read the book with a dictionary by your side! Robert Fass was an excellent narrator. Great diction. Russell H. Greenan, born in Manhattan and raised in the Bronx, served in the US Navy during World War II before completing his college education at Long Island University in Brooklyn, where he studied world literature. In 1966, while in Nice, France, with his wife and three children, he wrote his first novel, It Happened in Boston?, which was published by Random House in 1968, has been translated into several languages, and was released in a new German translation in 2007. Mr. Greenan’s many other novels include The Secret Life of Algernon Pendleton, Nightmare, and The Bric-a-Brac Man. Though now well into his eighties, he continues to write.